Plaid Hat Games is pleased to Introduce Gen7: Breaking Point, an expansion for our upcoming Crossroads game. Breaking Point adds components for 5-6 players and an all-new scenario! Gather your crew and continue your journey across the stars as humanity struggles for survival among the stars. Breaking Point adds two new barracks to the four found in Gen7: Logistics and Security. The Logistics Barracks can be used in any play of Gen7, benefitting from a third schema slot, allowing a Logistics player to further customize their strategy. 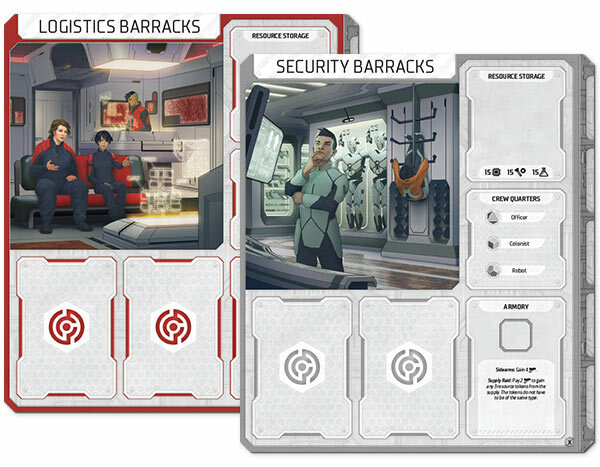 The Security Barracks is used in the special competitive scenario included in Breaking Point. In addition to two new barracks, Breaking Point also includes an all-new optional scenario for Gen7 players! Designed to follow the events of the base game, this scenario is a competitive version of the cooperative experience found in Gen7. We won’t divulge the story for now, but know that players will find their barracks in opposition to each other, and only one will emerge victorious. Prepare for an all-new way to play Gen7! Gen7: Breaking Point is available for preorder now! Breaking Point will be available in the early next year. Remember, Gen7 is available for preorder as well, and will be arriving at retailers and our own web store soon!